While in exile, Bhima once had to go out by himself on a mission. Passing through the dense forest along a narrow path, he came by a small old monkey lazing wayside with its long tail stretched out on the path. Looking at Bhima, the monkey addressed him thus: Are you not the great Bhima? My salutations to you! 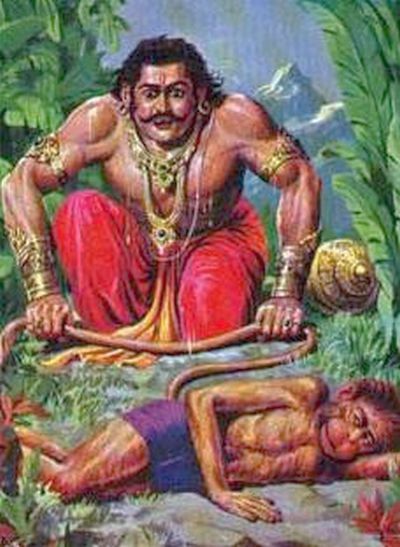 Bhima was, understandingly, surprised to come by a talking monkey and said with pride: Well, I am glad you recognise me. Now move your tail away so I can pass by. It is not wont of me to walk across any creature. The monkey said: Oh, dear, don't you see how old and sick I am? Will you please oblige and move the tail yourself? Bhima, thinking it rather unpleasant to touch a monkey and that too its tail, stuck out the little finger of his left hand and pushed it. But the tail did not move. Hiding his surprise, he used his whole left hand and tried pushing it. Yet it did not budge a mustard seed's width. To one endowed with the strength of eight thousand elephants, this was too much! Feeling crushed, yet hiding it, he used both his hands to push the tail but to no avail. Suddenly it dawned upon his not-so-brilliant intelligence that it was no ordinary monkey that he was dealing with. He fell at the monkey's feet and said: Oh, mighty one! I beg of you to reveal your true identity to me. I am your humble servant! Shedding his disguise, Chiranjeevi Maruti, son of the Wind god and Bhima's brother, revealed himself. He blessed Bhima saying: Shed your pride and take refuge in the Lord. You shall be victorious! My power shall always be with the Pandavas. I shall ride upon Arjuna's flag. Bhima bowed down to his brother in all humility.